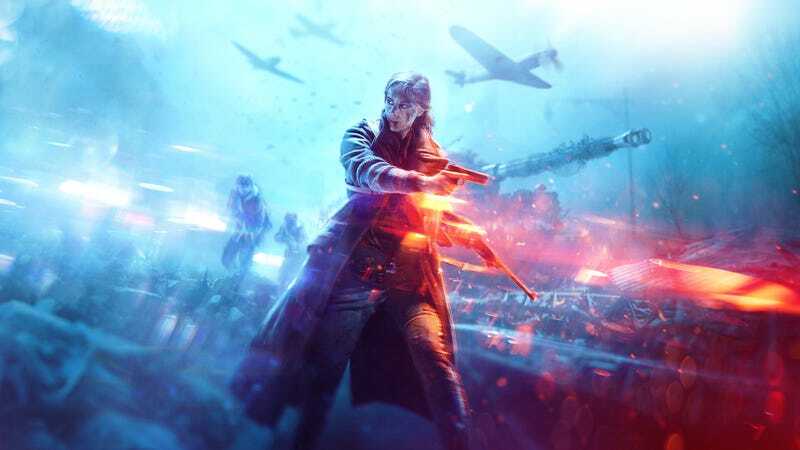 Battlefield is going back to World War II, developer DICE said during a livestream today, promising that the newly announced Battlefield V will tell “real stories about men and women who changed history” over the course of the second World War. Battlefield V will be out October 19 for PS4, Xbox One, and PC. Like 2016's Battlefield 1, Battlefield V’s single-player campaign will unfold through an anthology of War Stories, each telling a different tale from World War II. Co-op is returning to the first-person shooter series, along with a new multiplayer mode called Grand Operations. There won’t be any sort of “premium pass” or season pass in Battlefield V. You won’t have to pay for maps or modes, nor will you be able to buy anything that affects gameplay—as we reported earlier this year, DICE is being cautious after the outrage over last year’s Star Wars Battlefront 2. Shortly after the reveal, EA confirmed to Kotaku that the game will not have any form of randomized loot boxes. Previously, a report had suggested that the next Battlefield would have cosmetic-only loot boxes, but at the time, sources told Kotaku that report was premature and that decisions had not yet been made. “I can confirm that there are no loot boxes,” an EA rep said in an e-mail. DICE says it’ll show off the multiplayer on June 9 during EA’s E3 press conference at EA Play in Los Angeles.